The KEY-BAK RETRACT-A-BADGE CORD LANYARD with Badge Reel is a premium quality import engineered by the company that invented the original key reel. The 1-Inch diameter case is made of strong plastic. With 2 ounces of retraction force, the reel will hold anything equal in weight to 4 large keys. 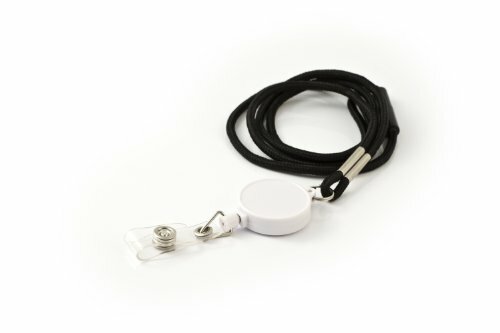 Whatever you choose to secure, know that the 36-Inch polyester cord that is in your RETRACT-A-BADGE lanyard and retractable reel combination will provide quality you can count on. Included is a vinyl ID strap and swivel end fitting for increased durability and versatility. The RETRACT-A-BADGE cord lanyard is 16-Inch long and includes a break-away for increased safety. The Retract-A-Badge by KEY-BAK Identification Series is a wide selection of access control and identification products, including: badge reels and lanyards. While not made in the USA like our popular MINI-BAK Series, these are a great alternative. Designed using the same technology we invented in 1981, these retractable badge reels are tested to 40,000 retractions and a great security device. This product comes with 5 lanyards with attached badge reels.